Pianist Dan Nimmer, bassist Neal Miner, and drummer Pete Van Nostrand. 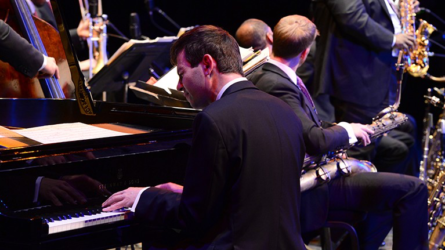 Jazz at Lincoln Center Orchestra pianist Dan Nimmer has prodigious technique and an innate sense of swing that often recalls his own heroes—Oscar Peterson, Wynton Kelly, Erroll Garner, and Art Tatum. Nimmer joined the JLCO when he was only 23 years old, and he has released multiple albums as a leader with the Dan Nimmer Trio. Featuring some of New York’s most in-demand musicians, the Dan Nimmer Trio is a highly refined straight-ahead group that shows off Nimmer’s range and virtuosity in a more intimate setting.